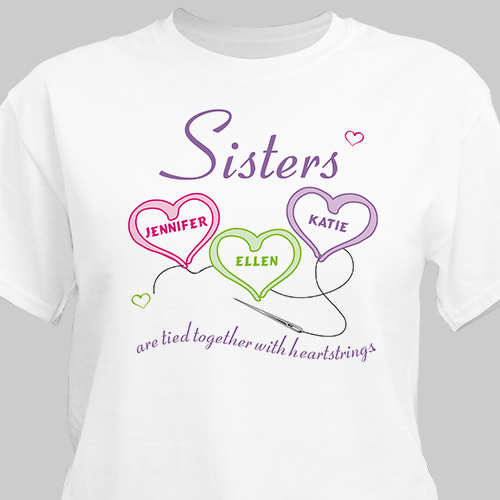 Display your love and affection for your sisters with one of these Heartstrings Personalized Sisters Shirt. Make it a truly unique gift for each sister to cherish for a lifetime. Sisters Personalized Shirt is available on our premium white 100% cotton T-Shirt, machine washable in adult sizes S-4XL. Personalized sisters shirts are also available in a lovely Pink or Ash Grey. Personalized Sisters gift shirts include FREE personalization! Personalize your sisters shirts with up to 6 sisters names, each inside their very own heart. I purchased this t-shirt for my sister's birthday. One of my sisters gave a 'Sisters' sweatshirt for Christmas, which I love. Everyone feels special with a personalized gift! I will continue to order from you! Shop more great sister gifts to find the best way to celebrate her for any occasion!